A new forum for digital health executives was launched today at HIC to promote health system excellence. The network is for people in senior executive roles related to digital health, for example, healthcare CIOs CMIOs, CCIOs and CNIOs and for people who are targeting those types of roles. 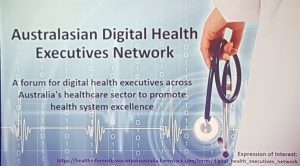 The Australasian Digital Health Executives Network is seeking input from digital health executives and emerging career professionals. A small working group has been established and there will be an interim governing body to take leadership of the initiative. Speaking at HIC this morning, health executive Richard Royle said the health sector needed health informaticians who could lead and guide it into a ubiquitous digital future. Health executives who would like to be involved are invited to complete this EXPRESSION OF INTEREST.